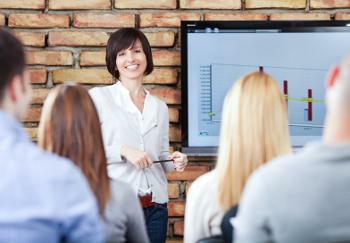 Do your PowerPoint presentations fall flat? When composing a PowerPoint presentation, you probably begin by compiling the information you want to impart. Then you organize it onto slides. This might be a good place to start, but don’t finish there. Think about preparing a meal for guests. You shop for food, empty the grocery bags and put things away. Imagine handing your guests the recipe and pointing to the kitchen. This might sound fun, but if you translate this to the meeting room, that’s what you’re doing when you gather data and organize it onto slides. It might be consumable by your audiences but perhaps not terribly palatable or very appetizing. So, if you feel like your presentations fall flat with your audiences, or that participants aren’t really engaged, you might need to heat some things up and throw in a sprig of parsley.